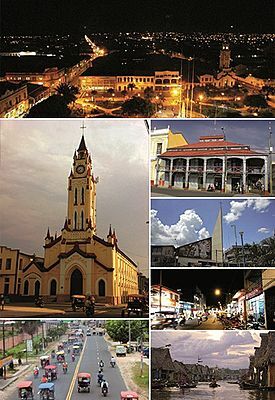 Clockwise from top: Iquitos cityscape at night; Iron House; minimalist architecture of the school auditorium St. Augustine; the commercial Jiron Prospero; Aquatic Avenue in the famous neighborhood of Bethlehem; Abelardo Quiñones Avenue and the vehicular traffic of motorcycle taxis; and Iquitos Cathedral. Iquitos, also known as Iquitos City, is the capital city of Peru's Maynas Province and Loreto Region. The largest metropolis in the Peruvian Amazon, east of the Andes, it is the sixth most populous city of Peru. It is known as the "capital of the Peruvian Amazon." The city is located in the Great Plains of the Amazon Basin. It is the largest city in the world that cannot be reached by road – it is accessible only by river and air. The area was inhabited for thousands of years by Amerindians. At the time of European encounter, the Napeano and Iquito peoples occupied the area. They had small seasonal settlements and were nomadic hunter-gatherers, living in close association with the rivers. The city name of Iquitos is derived from a group of native people called Iquitos by the Spaniards. Iquitos was founded in 1747 by Jesuit José Bahamonde. In 2012, 250,000 visitors were recorded. Many have been attracted since the Amazon rainforest was ranked as one of the Seven Natural Wonders of the World. Iquitos inaugurated international flights to the main hub of Panama City in 2012, with shared destinations with Miami and Cancún. Its international airport is expected to become one of six international air centers of Peru. The city was ranked as sixth on the list of "10 leading cities in 2011" of the Lonely Planet guidebook. Due to its location in the Peruvian Amazon, Iquitos has a green landscape with a vast variety of life. The flora is varied with great presence of 850 species, including 22 species of palms and orchids, who provide the attractive forest within the urban landscape of the city. The lilies also present. The extensive forests seated within metropolitan influence host fauna with 130 species of mammals, 330 of birds, 150 of reptiles and amphibians, and 250 fish. The Historic Center of Iquitos has several structures that have been designated as part of the Cultural Heritage of the Nation: the Cathedral of Iquitos, the Iron House, the Old Hotel Palace, Cohen House, and more than 70 other buildings. Other landmarks are the Plaza de Armas; Jiron Prospero, an avenue that is the site of several shopping and historical areas; and the lively neighborhood of Belén, often dubbed the "Amazon Venice" for its many waterways. The city is also home to the Amazon Library, one of the two most important in Latin America. The city can be reached only by airplane or boat, with the exception of a road to Nauta, a small town roughly 100 km (62 mi) south (which is not connected to the country's main road network). Ocean vessels of 3,000 to 9,000 tons and 5.5 metres (18 ft) draft can reach Iquitos via the Amazon River from the Atlantic Ocean, 3,600 kilometres (2,200 miles) away. Most people travel within the city via bus, motorcycle, or the ubiquitous auto rickshaw (mototaxi, motocarro or motocar). This is a modified motorcycle with a cabin behind supported by two wheels, seating up to three persons. Transportation to nearby towns often requires a river trip via pequepeque, a small public motorized boat. The northeast side of Iquitos in 1987, when the population of Iquitos still maintained its rural aspect in developing as a metropolis. Headquarters of Provincial Municipality of Maynas which is the main political entity that administers the city. The autorickshaw is the main cause of noise pollution in the city. The four urban districts of Iquitos: 1: Iquitos 2: Belén 3: Punchana 4: San Juan Bautista. The suburban and urban production zones are narrowly close to urban areas, especially south of San Juan. The limits are indicative because the city experienced a remarkable expansion. 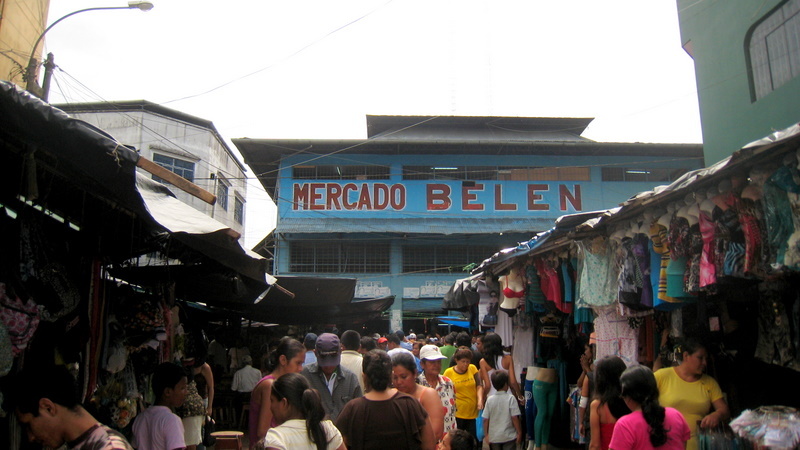 The Belen Market is considered the largest street market in the Peruvian Amazon, and an important commercial and economic exchange. Abelardo Quiñonez Avenue located in south of Iquitos. It is a larger preferential roadways. The Plaza de Armas and the Iglesia Matriz (nearly the middle of the image) in the Downtown Iquitos. The Iglesia Matriz de Iquitos is characterized by its Gothic Revival style and Swiss clock. It is considered one of the urban symbols of the city. 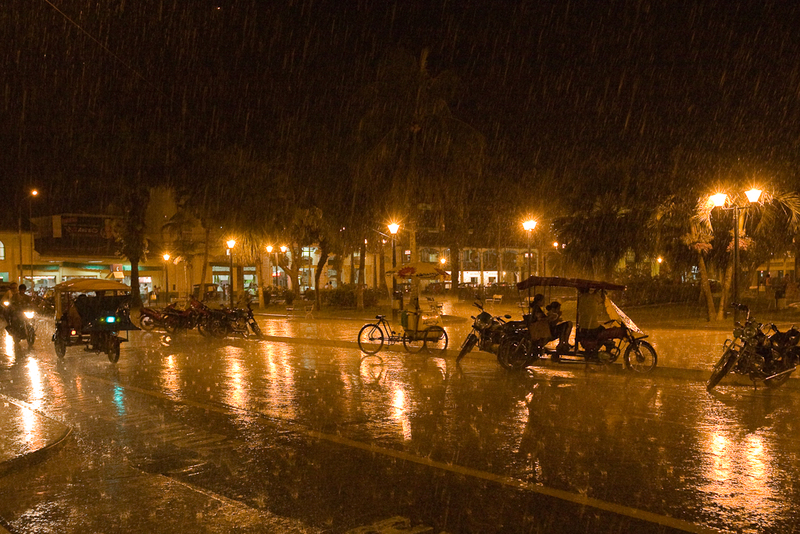 Accustomed rainy scene in Iquitos. In the picture the Plaza de Armas at night. The first film projection was presented with an Edison machine at Casa de Fierro, 1900. From top to bottom: Lower area of Belen District, Iquitos, and signature Amazonian horizon surrounding the city. Iquitos Facts for Kids. Kiddle Encyclopedia.